The Russian Poisk module is packed atop its rocket at the ready to launch to the International Space Station Nov. 10, 2009. A newRussian room that doubles as a docking port for the International Space Stationis ready for a planned Tuesday launch toward the orbiting laboratory. The newMini-Research Module 2, called Poisk (Russian for ?Explore? ), is due to blastoff atop a Soyuz rocket tomorrow at 9:22 a.m. EST (1422 GMT) from the CentralAsian spaceport of Baikonur Cosmodrome in Kazakhstan. Shaped likea large rounded-off barrel, the unmanned Poisk module is Russia?snewest addition for the International Space Station and comes with a vitalfeature: An extra docking port for visiting Soyuz crew vehicles and automatedcargo ships. 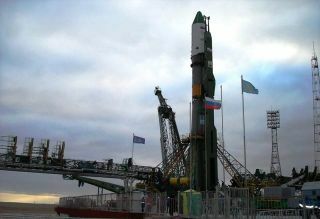 It is due to arrive at the station Thursday and boost the numberof Russian docking ports to four. ?We?ve beenworking on getting up to four Russian docking ports for years now,? KirkShireman, NASA?s deputy station program manager, told SPACE.com. ?This modulecoming up is going to bring that to fruition.? The station?sthree current Russian docking ports ? two on the bottom, and one aft ? accommodatetwo Soyuz ships and a visiting cargo freighter. NASA space shuttles dock to anAmerican-built berth at the front of theorbiting laboratory. Because thestation has a full six-person crew, it needs two Soyuz craft ? which carrythree people each ? docked at all times to ferry astronauts back home and serveas lifeboats in an emergency. Together with a linked cargo ship, they fill upall three of the available Russian berths, causing some traffic concerns fornew crews and supply ships. Shiremansaid Poisk will give the station more flexibility for handling space trafficbecause of its extra spaceship parking spot. The Poiskmodule is just over 13 feet (4 meters) long, about 8 feet (2.5 meters) wide andweighs about 8,000 pounds (17,636 kg). It has about 380 cubic feet (10.7 cubicmeters) of actual living space inside and is launching with about 2,204 pounds(1,000 kg) of cargo, about 1,764 pounds (800 kg) of which is madeup of Russian Orlan spacesuits and life support gear. NASAofficials did not have information from Russia?s Federal Space Agency on the estimatedcost for Poisk, Shireman said. The Poiskmodule is the first Russian addition to the space station since the 2001arrival of the Pirs docking compartment on the bottom, Earth-facing part of thestation and shares much in common with that earlier module. The station?sRussian segment is currently made up of two large modules (called Zvezda andZarya) and Pirs. Like Pirs,Poisk comes equipped with a cargo boom and external hatch to be used on Russianspacewalks. It has room for new space experiments to be attached to its outerhull. ?The reasonwhy the name of this new module is Mini Research Module is due to the fact thatthis new addition to the station will house a number of scientific experimentsthat will be performed under the Russian space agency science program,? said Russiancosmonaut Roman Romanenko, who is livingaboard the station today. The newroom will also launch unmanned, fly to the space station and dock autonomouslylike Pirs. Romanenko and Russian cosmonaut Maxim Suarev inside the station willstand at the ready to take remote control of the spacecraft should it veeroff-course. But Poiskwill be the first docking port to be located on top of the space station.Station astronauts performed two spacewalks earlier this year to prepare therooftop berth on the station?s Zvezda module for the new docking port. The Poiskmodule is actually one of two Mini-Research Modules built for the space stationby Russia. Its sister craft, Mini-Research Module 1 (MRM1), will launch aboarda NASA space shuttle next year and be delivered using robotic arms. Shiremansaid Russia also plans to launch at least one new, larger laboratory module tothe space station in coming years, but will make a formal decision on whetherto proceed once the outpost?s mission duration (currently slated to end around2016) is pinned down more firmly. Poisk islaunching first because it was ready to fly earlier that MRM1, NASA officialshave said. The International Space Station has been under construction since1998 and is the product of cooperation among more than 16 countries.